Purchasing a designer handbag is not something that I take lightly. I'm fairly new to buying designer pieces and while I love a little luxury, the truth is that these things are significant expenses and rarely an investment (something that I'll write a post about later). Often times, if I force myself to wait a few months, I'll find that I've changed my mind. However, this was NOT the case with the Céline Belt Bag. So much so, that nearly 1.5 years passed between the first time saw it and when I actually bought it! I first saw the bag on display at Saks Fifth Avenue. The overall shape is classic flap satchel, however, the unique strap design in front elevates the look of the handbag and warrants a double-take. The front strap is elegantly knotted in two places and the ends hang past the base. It's beautiful in its simplicity! 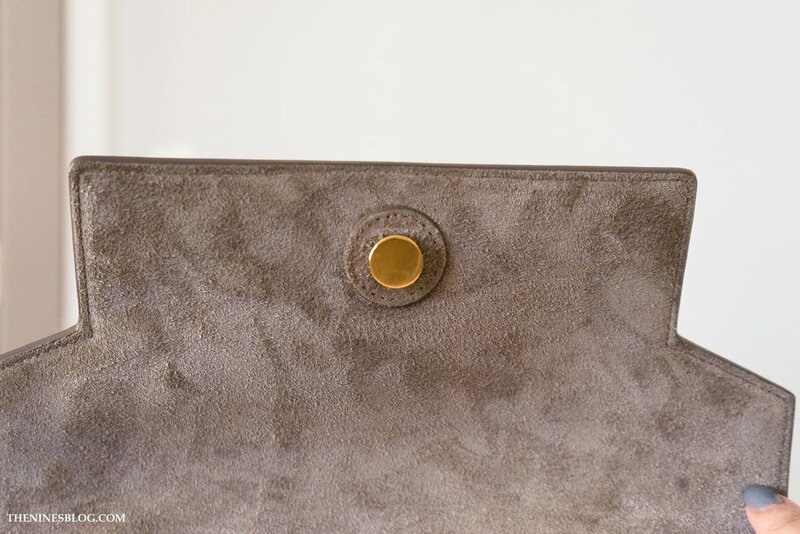 Calfskin is the main material throughout; a grained calfskin on the exterior and suede calfskin as the lining inside (SO incredibly soft by the way). 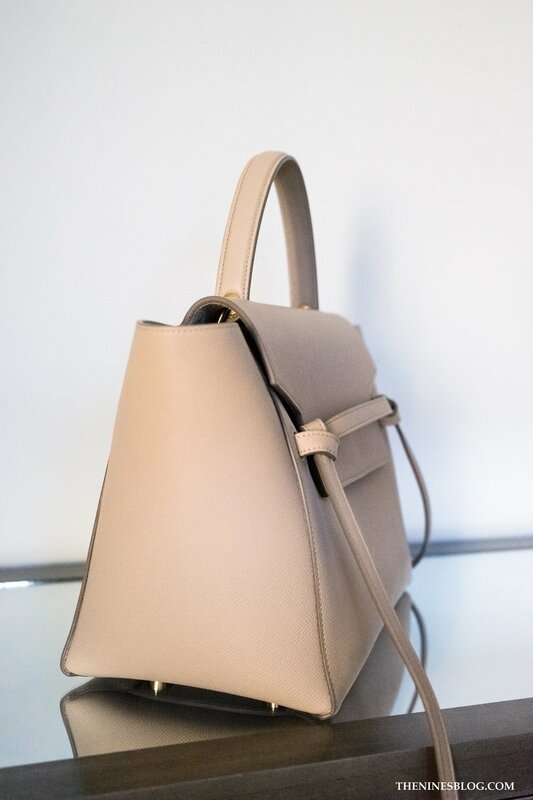 In the Céline boutique, I was torn between the light gray versus the light taupe colors, but ultimately decided on taupe as it was an easier color to wear. As per my aesthetics, I love shiny gold hardware. I selected the mini size (also comes in micro) but the name is deceptive; it is actually a generous size. I had zero issue fitting in my basics (wallet, iPhone, sunglasses + case, keys, small cosmetic pouch, and hand sanitizer). The interior is roomy, measuring 11" x 9" x 6"; there are two small flat pockets inside and a zipper closure under the flap. The exterior has one zipper pocket on the opposite side of the flap. I personally never use the inner zipper or the exterior zipper pocket (fits a smartphone). For ease of access, I'm content with securing just the flap. My preferred way to wear the bag is on my arm or in hand by the top handle. Depending on the outfit, the bag can look slightly large against my 5'4 frame. I rectify this by putting on a pair of 2.5 to 3in heels and it seems to even things out. The detachable shoulder strap has a short 14" drop so it is meant to be worn only on your shoulder (vs. cross-body). This is such a thoughtful design choice! The bag hangs between my waist and upper thigh. I personally love this length; it's perfect for my frame! When I wear the shoulder strap, I like to think it is like a (very) upgraded messenger bag. There are two other notables with the belt bag that needs to be mentioned and it centers around the flap's design. Some may find these to be negatives. The locking mechanism is not a snap or typical magnetic closure. You actually have to slide the flap side down and then up against the bag to catch the locking clasp. It's a little tricky, and takes a few tries to get acclimated to the motion. 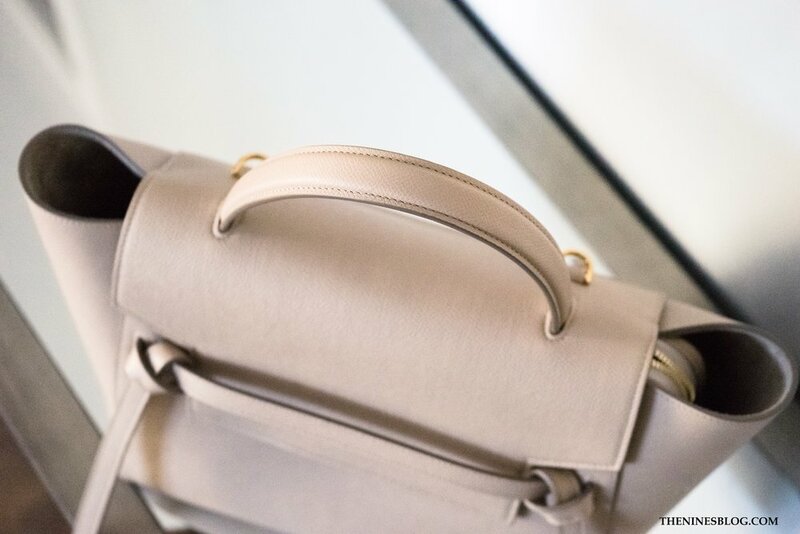 The top handle (which is sturdy and gorgeously crafted btw) goes through the flap, making it nearly impossible to open the bag when carrying it by the top handle. I find that I have to either set down the bag OR pop on the shoulder strap and then open. For me, the Céline Belt Bag is wonderfullllll. It is refined, stylish, and most importantly, functional for everyday use. Whether I'm going to work or running errands, it holds all of my necessities and then some. I know that I will keep this bag for years to come. 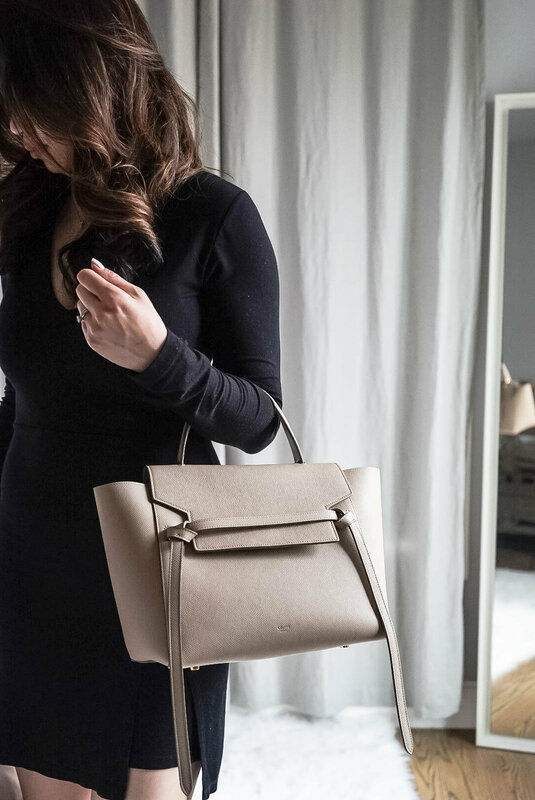 Have you considered this handbag? What do you love or dislike about it? Let me know in the comments.